Fall is always a bittersweet time of year for me. The crisp mornings, warm afternoons and beautiful foliage are a welcome change from the heat and humidity of summer. Those cooler days come at a price; they signal the end of the gardening season. Thanks to deer fencing, I now have a very large flower garden. So large, in fact, that I have run out of room to grow anymore flowers horizontally. This year, given my lack of horizontal dirt, I decided to garden vertically. An idea that seems creative in the warmth of the May sun can become a problem on a frosty October morning. One afternoon this past May, I was feeling particularly patriotic in the garden center. 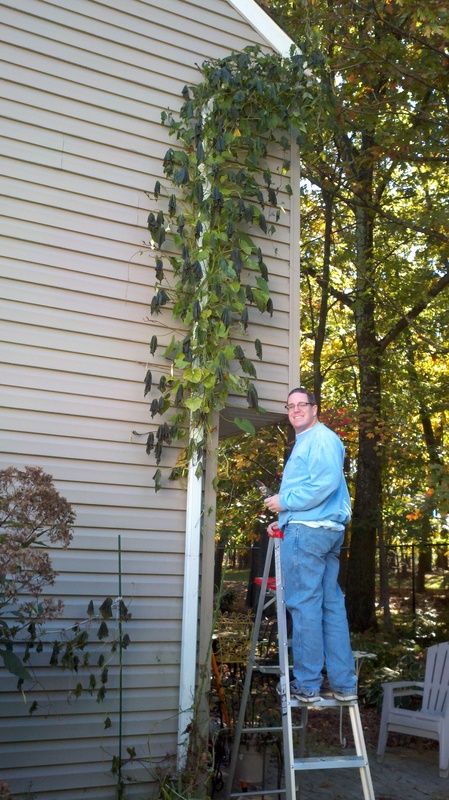 I bought 3 varieties of morning glories: red, white and blue and decided to train the vines to grow up a 7 foot stake. I had visions of beautiful red, white and blue flowers bursting open by the Fourth of July. By the end of June, the vines had surpassed the end of the stake, stretched over and began winding themselves around the downspout from the rain gutters. Oregano and I thought this was an intriguing way to disguise the downspout so we left the vines alone and let nature take its course. By August we had numerous beautiful flowers, though we never seemed to have the red, white and blue flowers at the same time. We also had a vine that had traveled up to the second floor of our house. I began to foresee a growing problem. How would we remove the vines when the time came at the end of the season? I posed this question to Oregano who told me we’d worry about it in the fall. In September life got busier and I wasn’t able to spend as much time in that section of our garden. The vines grew unchecked. On an October afternoon, I was standing in our side yard having a conversation with my neighbor. Her back was to my house and as I was looking at her while she spoke when I noticed something strange. My eyes widened and my mouth dropped open. The morning glories had wound their way around the downspout all the way to the roof and attached themselves to the nearby oak tree. My neighbor turned around to see what had caused me to have such a reaction. Then her mouth dropped open. “Wow! That looks very pretty, but how are you going to get that down?” she asked. When Oregano came home from work I took him to the garden to show him the stalk of vines so large it seemed to have sprung from magic beans. I expressed my concern about removing the vines when we don’t have a ladder that reaches that height. We discussed our options. Should we rip the vines down now while they are still blooming and the vines are strong? Do we wait until the first frost and then rip it down hoping the vines are still strong enough to be pulled? Oregano’s theory was to just let it die and eventually fall to the ground. We discussed our plan of attack, surveyed the garage for the necessary equipment for the task and hoped for the best. Armed with a 5 foot ladder and a tree branch lopper, the time had come to deal with the results of our experiment. We started off strong and were able to yank and remove long sections of vine. Oregano stood on the ladder wrapping the lopper around any available vine while I stood back in the grass calling out the correct direction to pull to dislodge it. 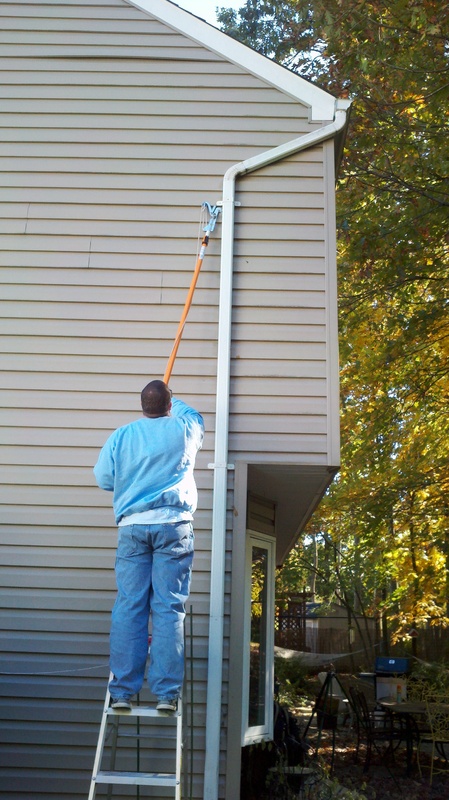 Everything was going so well until we go to the bracket holding a curved piece of downspout. We had hit a snag. Oregano got off the ladder and we stood in the dewy grass surveying our options. Twirling the vine like spaghetti seemed to be an effective technique for those stubborn, hard to reach pieces. It seemed our best choice would be to twist the end of the lopper around a section of vine and twirl it like a strand of spaghetti. This was a tedious endeavor, but eventually our efforts were rewarded with a downspout free of vines and two adults with no injuries; more than that we could not have hoped for. “Maybe next year we should just grow it along the top of the fence,” he said untangling a section of vine from around his ankles. Victory was ours that day! Posted in Uncategorized and tagged autumn, gardening, growing morning glories, humor, life, morning glories, nature, plants, teamwork. Bookmark the permalink. …is that what the Ive League colleges do every fall? If it is what the Ivy League colleges do every fall, we may have a second career ahead of us. So Oregano cleans off the vines and you take pictures of it? What a deal! After 17 years of marriage, we’ve learned each other’s strengths and weaknesses. My strength is standing on flat ground offering directions to the guy balanced precariously on the ladder. I’m glad you didn’t just vine about it. Oh I wish I knew your secret. I have been trying for years to get morning glories to do that at my place. Alas poor me, no such problems as you are having. Beautiful pictures. 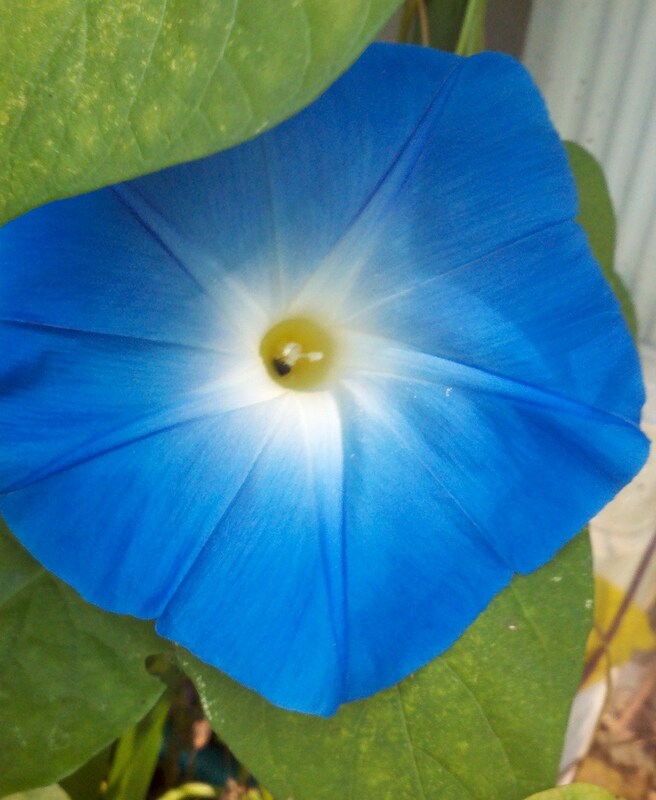 This was the first year I had such success with the morning glories. They had late afternoon sun and were in a spot that wasn’t too wet and wasn’t too dry. Clearly, that made them happy. Good luck if you try growing them again. Thanks for taking the time to read and comment. Hope you’ll visit again soon. Frankly, I’m surprised it went as well as it did. I had visions of a few dead leaves hanging from my gutter for many seasons. I’ve seen ivy cover a home. When it’s just a little bit, it’s very attractive. But when it looks like it’s ready to consume the home, it’s time to go. Your timing was perfect and I’m glad you survived without a scrape. I do like when there is enough ivy on a home to be aesthetically beautiful, but there is a fine line between that and a creepy, vine-covered house. I’m glad there was a frost or we would have had to find someone to climb the oak tree to get the vines down. Dear lord, don’t do it! The previous owners of our house only picked landscaping plants if the word “invasive” was in the description. That included morning glories. Those things would take over the whole yard if we let them. They would also take over our garage as they also are growing INTO the garage!!! And we don’t get those killing freezes like you do. One of our jobs this winter is to wade into the front planter, cut back all the bushes, expose some dirt, and hope we can find where these things are rooted so we can yank them out. Once again, I say, don’t plant any more of themI I have a feeling those dratted things are going to be coming back into your yard next spring anyway…. I have plenty of experience with invasive plants. I made the mistake of planting mint in the garden before I had the fence because I thought it would deter the deer. The fence is up. The deer are gone, but the mint is everywhere no matter how much of it I yank out each year. Luckily, the morning glories won’t come back next year because of our climate. They are an annual here and won’t re-seed themselves. I’ll find a place to plant some new ones next year where their growth can be kept in check. Sounds a little like Jack and the Beanstalk! Several years ago at a different house, I planted ivy in the front to hopefully cover up the ugly brown brick that was on the house. One day a friend was standing in the foyer and commented that he thought it was cool I was growing ivy inside the house. The ivy had grown between the sidewindow glass and the frame and made it’s way into the house. It was 6 inches long and I hadn’t noticed it. That’s how I learned about the power of vine plants. Jack and the Beanstalk was exactly what I thought of the first time I saw the vine that high. I kept a close eye on the vines so that they didn’t reach under the siding because I had heard stories like the one you mentioned. Needless to say, I don’t think we’ll be using the downspout as a support for morning glories. You are right. I’ll have morning glories again next year, but you can bet that I won’t be growing it up the side of my house. I have the whole winter to think about where I can plant the morning glories next year. Sean would have loved to have tried out his Little Giant! I’m glad nobody got hurt either, since I would have been the one to fall off the ladder (which was a couple inches deep in mud). 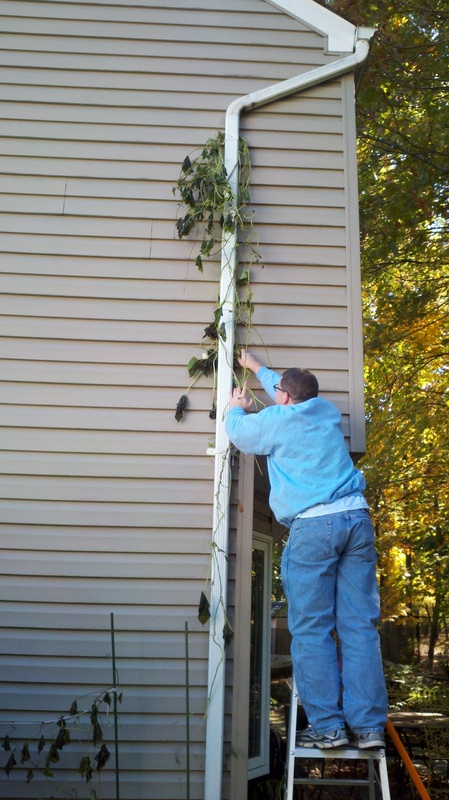 I wasn’t very optimistic that we could get all of the vine off the house, but we did it, and it only took a few short hours. You were very patient and persistent with yet another one of my cockamamie ideas. It’s a good thing you’re so good humored. “It was like an alien creature was taking over the yard.” Had to laugh when I read that – you are beginning to understand what you are dealing with. Here our winters are pretty mild, so the vines may get knocked back but don’t die…each year they get stronger and grow faster…our neighbor’s are so beautiful and we love looking at them…then we all realized the vines are taking over the neighborhood…from yard to yard we beat them back. Unseen, the roots are smug underground all winter…waiting…to show up in the spring everywhere! Good thing the blooms are so pretty. You might want to consider hanging wire or chickenwire for the vines to grow on beside the house. The vines grow into siding and can cause major damage. Good thing the blooms are pretty! 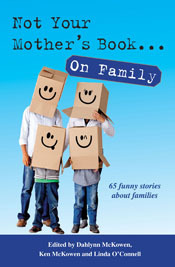 Such a funny post – so familiar! I hadn’t thought of hanging chicken wire or some sort of trellis for the morning glories to grow on. Thanks for the idea. I’ve heard nightmares about the damage that can be done if the vines get inside the siding. I don’t think I’ll be planting them against the house again next year. I have the whole winter to figure out a new location. Our house closing is October 30th! Excited! When you choose a vine to plant, keep in mind that you aren’t living in NJ anymore. The vines will grow all year instead of dying back in the winter. Can’t wait to see pictures of your new house vines and all. We have some morning glories that come back every year growing over our back fence. It’s nice makes a wall of green and blue. Still we have to vigilant to keep it trimmed from the garden shed, the garage, the walkway, the vegetable garden… they do grow! I didn’t realize morning glories are so invasive. They are a tender annual where I live so they don’t come back from year to year. After reading comments from readers in areas where morning glories continue to grow, I’m glad we had the frost when we did. I live in Wisconsin and they reseed themselves and come back every year. The ones we have came from Michigan, my husband’s grandmothers garden. They are invasive but since they do reseed themselves well here and do come back despite our harsh winters you often find them on cemetery walls (pink, blue, and deep purple). It does make the cemeteries look lovely in the summer. I’m surprised to learn that they reseed themselves. The variety we have here has never done that. I guess I’ll wait and see what happens next spring. Oh ours does if you go out and look at them now it’s lots of tiny pods that burst open and drop powdery seeds. I’m sure there are some hybrids that have been developed not to do that because they do grow like mad. Yes if it starts you want to keep it in hand… It’s part of our routine in the summer to trim the glories. Or that’s all we’d have! 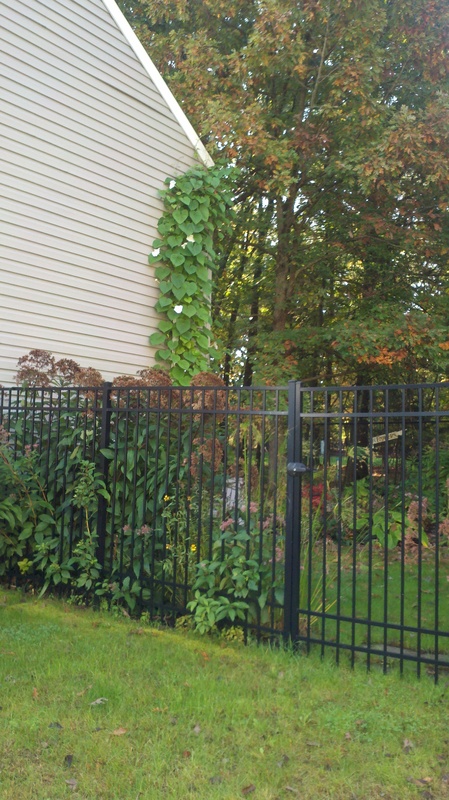 You are fortunate that the vines did not become entangled within the seams of the vinyl siding…then pulling down the flowers would have resulted in a greater problem….it would have been a “nightmare” from the “morning” glories !!! Maybe next Spring you could plant some of those flowers on a particular building a block from your place of employment as a way of enhancing its visual appeal (if that is possible). They could climb to new heights and be the “talk of the town.” They could be nurtured in the existing greenhouse by the young apprentices before being given the chance to do their thing on the drains. Just a thought…. I’m realizing how lucky we were that the vines didn’t grow under the siding. I was so fixated on those red, white and blue flowers that I didn’t think of the possible problems they would cause. Maybe I can sneak over to the building you are referring to and secretly plant the morning glories. They’ll be able to enjoy a nice surprise and the budding landscapers will have something to tend to. Oh, Glory! Those are certainly some turbo vines – what were you watering them with, coffee? 🙂 Whenever a ladder is involved, I am glad to hear that no one got injured! Those were only the vines that grew upwards. There was another 20 feet of vines that grew outwards into the lawn. I had to cut those back. It was like an alien creature was taking over the yard.